Free Shipping Included! Mariell Bridal & Wedding Bracelet with Multi-Shaped Cubic Zirconia, Perfect for Brides or Mother of Bride by Mariell at SCRHI. MPN: 3562B. Hurry! Limited time offer. Offer valid only while supplies last. 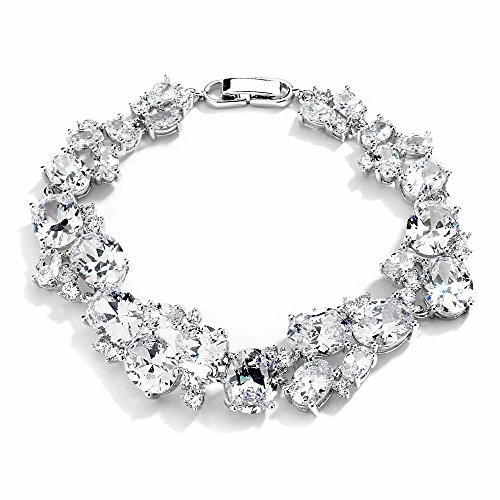 Mariell's exquisite 7'' wholesale bridal bracelet is 5/8'' wide with mixed shapes of Cubic Zirconia stones so it can coordinate with other CZ jewelry. Mariell's exquisite 7" wholesale bridal bracelet is 5/8" wide with mixed shapes of Cubic Zirconia stones so it can coordinate with other CZ jewelry. Our irresistible silver rhodium bracelet will be the talk of your wedding, black tie affair, gala or society event. Mariell's Exquisite Wedding Bracelet is as Versatile as it is Gorgeous. Perfect for Brides!